Call Us Today! (406) 728-0022 Connect with us! While cats aren’t necessarily known for their sense of smell, they actually have an amazing olfactory system. They even have more scent receptors in their nose than the average dog (scent hounds not included). By comparison, cats have around 200 million scent receptors in their nose, while humans only have 5 million. Additionally, cats seem to have a better ability at differentiating a variety of scents. There is a protein, called the V1R protein, which is believed to control the ability to separate scents from each other. Humans have 2 variants of this protein; dogs have 9 variants; but cats have a whopping 30 variants. This has led some people to advocate for training cats for search and rescue, especially since they can fit into smaller spaces than most scent dogs. So, how does this affect your cat’s daily life? 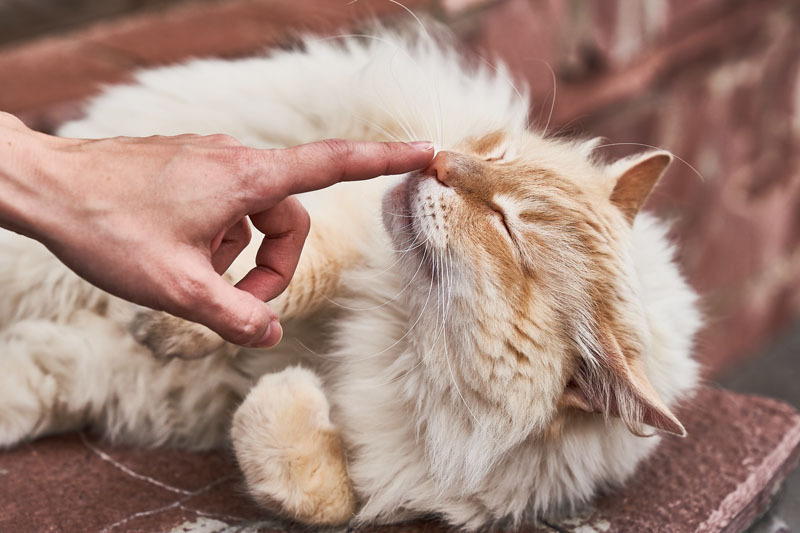 Cats use scent (via pheromones) to mark areas as “home.” They do this when they rub their cheek or scratch on objects. They want to mark the unfamiliar scent with their own scent, which is accomplished by rubbing, scratching, or spraying urine on it. This is one reason why cats like to mark new furniture. One study found that a lack of appropriate scent varieties could be a stressor for indoor cats and may lead to litter box issues such as spraying. However, there are also some scents which cats don’t like, such as citrus and tea tree oil. Unappealing odors can also be a reason for litter box avoidance. Not cleaning the litter box often enough–especially for covered boxes–can lead to a buildup of foul odor that prevents a cat from using the box. Some scented litters can also have the same effect. Furthermore, smell can also affect a cat’s overall health. A cat’s hunger is stimulated by smell rather than taste. It’s one of the reasons why cats with respiratory infections stop eating: if they can’t smell their food, they won’t know it’s there. While this won’t harm younger cats that pickup eating after a day or two, this can lead to dehydration and debilitation of older cats, especially those with kidney disease. In general, scent and smell have a very important impact on a cat’s day-to-day life. If your cat is exhibiting behavior or eating problems, the scents of their environment may be an issue worth discussing with your veterinarian. A better understanding of the how cats perceive their world can lead to healthier, happier kitties! Copyright © Cats on Broadway Veterinary Hospital. All Rights Reserved.